A pop up menu will appear with each new highlight, but the red flag icon is only available in the continuous menu at the top right. This is the icon used to archive articles when they have been read, noted, and are ready to be saved in a Diigo account for later use. As articles are archived by the user, the title of the article and all highlighted sections and reader comments will be shown in the account without viewing the article itself. 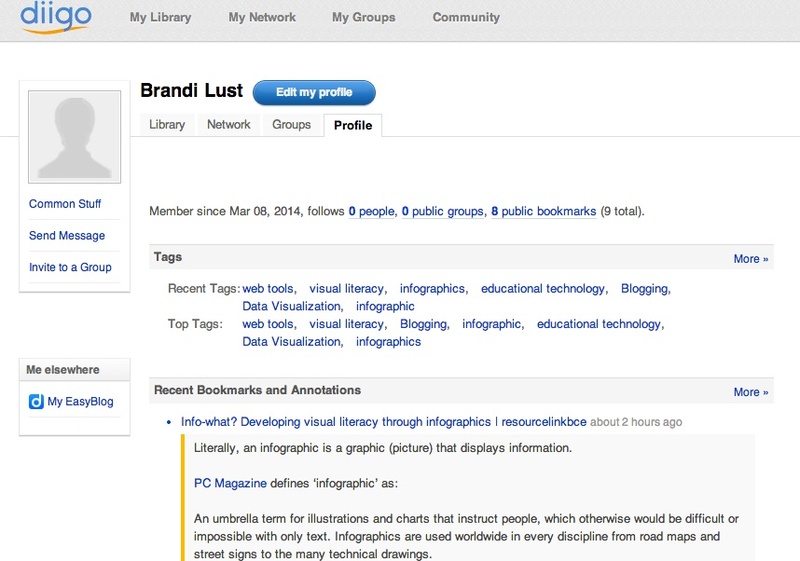 When saving, tags can be added articles to make them searchable. In addition, “lists” can be created where articles will be placed for organizational purposes. These labels will be helpful when in the Diigo account (available via logging in to the Diigo website) because the popular and recent tags are listed at the top of the screen, and an article can be tagged for multiple purposes. The lists are shown to the right, and when a list is clicked on, all saved articles in that category appear (see below). Click on this icon to see options to save a screen shot of a page in the Diigo account, share a page using various social media options, or save a page to read later. In addition to teachers using the application for their own purposes, students can set up accounts to use Diigo for individual research. In addition, there is a function to create groups. Teachers can create groups of classes to share information, and students can also set up their own groups if they are working on a research project/question together. This blog graphic was created through Canva.com using nothing but a background, “text holders,” and an arrow graphic. 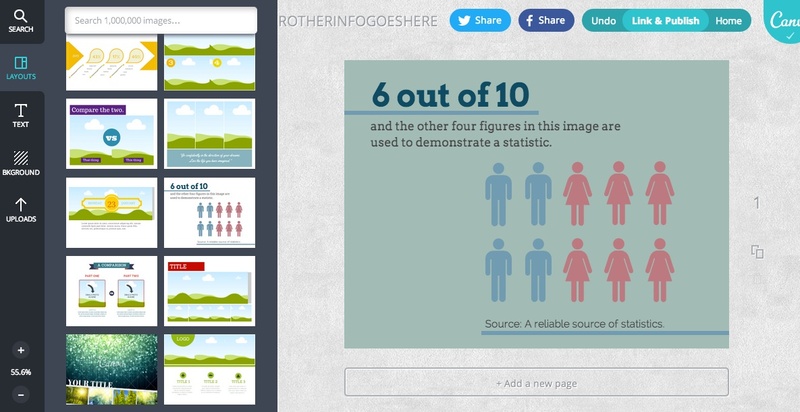 Beautiful, well-designed graphics can help to make information engaging and meaningful. 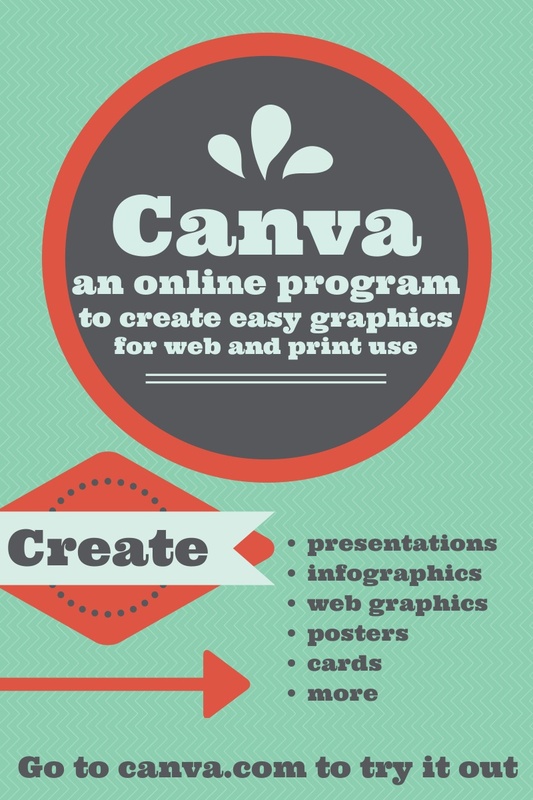 Canva.com is an online program that can easily be learned in less than fifteen minutes. When you create an account and login to the site, you have the option to create for social media, posters, presentations, blog graphics, Facebook covers, documents and cards. To create the image above, I used the “blog graphic” option. Below is the same screen I was brought to but for a “presentation” instead. From there, users can use the side menu to choose elements for the design. Any element a user wants to use can be dragged and dropped into the workspace. In addition, to the right of the workspace, pages can be added, deleted or copied to the same file. Layouts- Layouts set up a background and slots for text, images, and graphics. These can be deleted as needed, however. In the picture above, I had chosen a “layout” displayed on the right. Text- In Text, there is an option for Headline, Sub-Headline, and Body text. In addition, there are various designed graphics with text boxes in them. The fonts color, size, and style can be changed in the menu that appears when you drag and drop the element on your page. Uploads- These are images you upload yourself. The program can choose from your computer files (or from Facebook photos of you give it permission). If you have chosen a layout with photo boxes, then you can drag and drop your pictures into them and crop the photo to fit best once it is placed. Although the program suggests saving as a PDF to print, I was not able to get this function to work. Instead, I saved as an “Image” and it printed right away. As an image, you can choose “fit to page” for the image to fill more of the space available or keep it set as the default with no changes. Either were fine for me, but it might just be whatever fits best for your design. I can imagine this tool being used by teachers to create posters, presentations, or graphics for a class website. However, I think the most valuable way to use this tool would be for students. Speaking and listening standards ask students to “integrate multiple sources of information presented in diverse media formats, evaluating the accuracy and credibility of each source.” To this end, I think exploring and discussing infographics and other visual sources that integrate text before using this program would be valuable. The standards also ask that students “make use of digital media (e.g., textual, graphical, audio, visual and interactive elements) in presentations.” After students have explored others use of graphic elements to present information, then they could use this tool to plan their own presentations. These strategies will meet standards, but will also help students to increase their visual literacy, or ability to interact with and interpret visual information. In the digital age, this skill is necessary to navigating a breadth and depth of information that has never before been available. More and more, designers, business leaders, journalists and others are relying on graphic representations to relay information quickly and easily. I’m not the only kid who grew up this way, surrounded by people who used to say that rhyme about sticks and stones, as if broken bones hurt more than the names we got called, and we got called them all. So we grew up believing no one would ever fall in love with us, that we’d be lonely forever,that we’d never meet someone to make us feel like the sun was something they built for us in their toolshed. So broken heartstrings bled the blues, and we tried to empty ourselves so we’d feel nothing. Don’t tell me that hurt less than a broken bone, that an ingrown life is something surgeons can cut away, that there’s no way for it to metastasize; it does. Essential Question: How can fear, suspicion, and ignorance lead to cruelty and destruction in society? What allows individuals to be cruel to one another? What are some of the effects of this cruelty on the individual? On society? Have you seen examples in your own personal experience? From where does prejudice and suspicion come? What are the effects on the individual who is experiencing prejudice? The one who is prejudice? How does prejudice add to the cruelty of society? 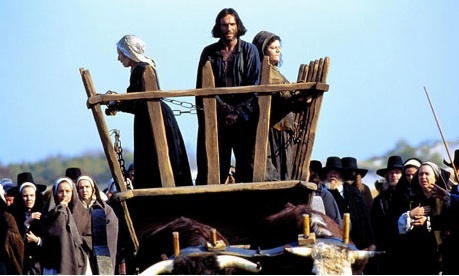 What role does ignorance play in cruelty, destruction and prejudice in society? What are the causes of mass hysteria? What is groupthink? Describe positive and negative effects of this phenomenon. How does it impact society? The individual? How does modern technology affect groupthink in positive and negative ways? What are some modern day examples of a “witch hunt”? Why do they exist? How might one be caused? Is human cruelty implicit or is it something that can be overcome in the individual? Provide examples to support your thinking. What are some methods to alleviate fear and suspicion in society? What are some methods to alleviate human cruelty in society? To answer these questions and find support, students were given the following list of non-fiction sources to use in addition to evidence from the play. These resources are also listed in the handout for students at the bottom of this post. A man talks about how he came to be a bully. It is a very personal take on the article on the effects of “prejudice” on the individual, as he experienced bullying growing up because of his weight. This video has the same information as the one above, but has a different tone. It provides some examples about how groups think more effectively than individuals. In what way can communicating with others (particularly peers) promote your personal growth? What are some of the types (modes) of communication that are most valuable? They then watched a video on the Teaching Channel showing the new model. Students were given a list of questions to note differences in the roles and types of sources from what they had experienced in the past (See this video for the example). Before the seminar, each student had to choose three non-fiction sources to read in preparation. They took notes over the sources using a “summary sheet” created by Melissa Larisch (see the bottom of the post to download). In addition, students were given the half-time feedback sheet and a list of advanced transitions to use during the seminar (also at the bottom of this post). During the first day of the seminar, Bosse and I facilitated together. We were both very pleased with the use of textual evidence and students’ overall engagement in the discussion. In addition, the richness of the ideas presented reflected deep thinking from students. Overall, I have found this method of Socratic seminar to be a very dynamic, student-centered approach. 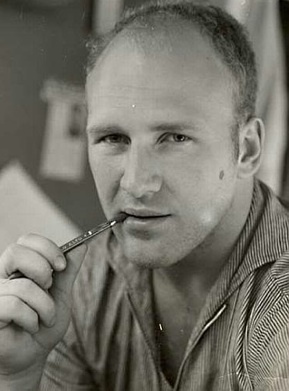 Ken Kesey wrote One Flew Over the Cuckoo’s Nest after working in a hospital and feeling the mentally ill housed there were not necessarily psychologically disturbed, but instead misunderstood. Mental illness is often misunderstood by teens (and sometimes adults as well). Pete Planisek wanted his students to explore misconceptions about mental illness in conjunction with a unit using One Flew Over the Cuckoo’s Nest. To meet these goals, we planned a three-day lesson where students used a variety of sources to explore thinking on topics related to psychological illness. RI.11-12.7: Integrate and evaluate multiple sources of information presented in different media or formats (e.g., visually, quantitatively) as well as in words in order to address a question or solve a problem. I can explore my thinking on the issues of mental illness via print, multimedia, and infographic sources. I can share my opinions with others using textual evidence in classroom and group discussions. 1. Explain how we, as a society, determine who/what qualifies as mental illness? 2. Provide reasons why we have a bias towards the mentally ill? 3. Does society maintain its own level of insanity (consider social norms, cultural practices etc.)? Provide (2) examples from our society and (2) from either Part 1 or 2 of the book. 4. Identify rights the mentally ill should be entitled to. 5. What are some of the effects (positive and negative) of mental illness on the individual and the family or friends of an individual with mental illness? 6. Identify connections between creativity and mental illness. Connect to events, characters, or themes from Part 1 or 2 of the book. Some of these questions were difficult for students to answer at first, for example the “positive” effects of mental illness on the individual were difficult to note. However, many of the resources provided additional context for students to reconsider the question. After students recorded initial responses, they examined a variety of sources relating to the questions and recorded important information on a notes sheet to reference later. Each group had to choose an article, an infographic, and an audiovisual source to analyze. This infographic provides a wealth of information about mental illness and its effects on the individual and society. This infographic provides information about mental illness, discrimination and the literal cost of mental illness. An eye opening account of what we spend, treat, or fail to treat here in the U.S. Which sources were most convincing and why? Which sources were most reliable? Which sources were most effective? How did your perspectives change based upon the information you analyzed? Which information influenced this change and why? With a shortened class period again on the third day of the lesson, we were not able to fully develop the conversation as we had intended. However, we did have some interesting conversations about the information read and the types of sources used. Many students found the TEDTalks telling individual stories to be one of the most effective means of receiving information because they enjoyed the first-person perspective version of the information. We discussed how this information appealed to emotion most. We also discussed how the infographics were a fast and reliable way to receive information. Some students enjoyed this format, but others found it to be overwhelming because they had trouble conceptualizing how all of the information was connected.